this is great stuff for hot spots too! Had a GSP that was wet almost all summer, he loved the water. This worked on his "hot spots" and eased his itching. Now I'm searching for the Happy Jack tapeworm pills. Lots of rabbits this summer too! Hi. I need a new bottle of Pad Kote. My mare had hurt her heel, and all healed well except for a dime sized spot that was always raw. Vet had nothing for it. I saw (some years ago) your adv in a magazine where someone had used it on an injured horse. 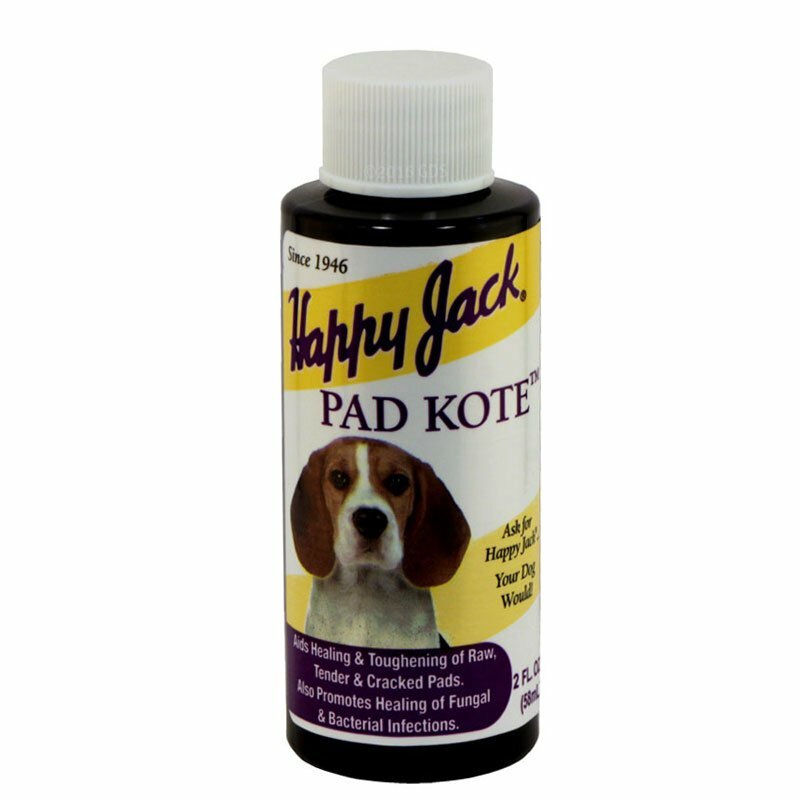 I ordered some and even tho it was winter conditions, the Pad Kote stayed right on the spot and it healed with tough skin and I will swear by it. I gave my part of a bottle to a friend, and now need more as one horse scraped her heel. VERY GOOD STUFF. Superb product. Heals crunchy paws and any skin irritation. A little messy, but all worth it! I still don't like the color, the sent has started to remind me of bacon or a campfire. The trick with the bottle is to not squeeze it and if you want more just tip it over again. I have actually gotten very good at not getting it on me or the pup and he actually doesn't mind it much, he actually falls asleep a bit while we put it on. It still takes forever to dry, maybe I am using to much or what not. Its ok I just lay him in front of the fan and make him stay for about 10 minutes then I run him on some cardboard and were all good. The only reason I am updating my review, is that the stupid purple product, actually seems to be working... After 5 days of his paw seeming to get worse and going through a second layer on 2 of his paws. His paws seem to be much better. We actually went swimming yesterday on rocks and what not, I really though his foot would be trashed like it did last time. To my delight they appear to be fine. I am guessing the made it purple so you can see where you put it, unless of course your puppies pads are black, like 2 of ours.. lol I am not saying this is the best things for feet, only that it works. This stuff is bright purple, really pungent, and not the easiest to apply. There is a small hole and the bottle doesn't squeeze much, I tried using some cotton balls and que-tips, but it didn't really work so I put a few drops directly on his paws it appeared to soak in and spread naturally. It took a bit to dry so there are a bunch of cute purple paw prints all over some cardboard. I have no idea why they made the product purple. I bought this product from a local supplier for $12 after tax, I should of bought it from gundog. When your done just use some alcohol to clean your hands, takes about 8 minutes to dry from my puppies paw..
Pad Kote from Happy Jack -- 2 oz. Pad Kote relieves dry, cracked pads due to fungus as well as other moist or sore areas in feet, ears or elsewhere. Pad Kote is a terrific healing aid for minor cuts, wounds, sores, tender ears and hot spots. Contains the fungicidal dyes Gentian Violet and Brilliant Green, along with other healing aids that promote granulation and epithelial growth. Made in the USA. Shake well. Apply once or twice daily. Allow to dry before releasing dog. Use alcohol to remove stains from hands. Not for use on animals intended for food.